This hands-on, no-nonsense guide to running smaller projects up to £1m in value will become your 'bible' in day-to-day practice. Smaller practices often find it hard to turn a profit as they spend too much time and money, especially on the design stages, trying to compete and are unsure as to what they can safely dispense with whilst still being rigorous and delivering quality. The author provides reassurance as to how to achieve great results on a budget, utilising stripped-back and efficient solutions, while following the principles and stages of the new RIBA Plan of Work 2013. Each chapter provides; simple step-by-step guidance to the key tasks in that stage of the Plan of Work including inputs, outputs, stage activities and sustainability checkpoints. guidance at each 'Plan of Work' stage on the relevant practice issues that will help you to run your small project more effectively. This book is designed as a project handbook for smaller and medium sized architectural practices but will also be invaluable for Part 3 students getting to grips with how projects are run within the framework of the new Plan of Work. 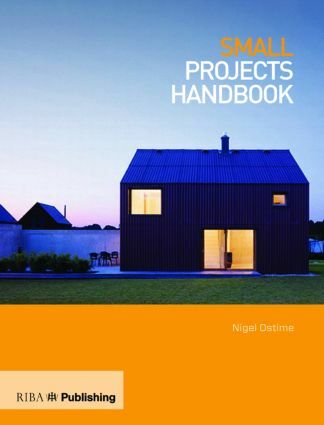 However, everybody in the project team - including clients, contractors and consultants - will find this a handy guide to the project process, full of useful insights and solutions.